Yes, my lackadaisical day began in surprising sunshine. I say “surprising” because I happened to be in New Haven, Connecticut. In another era, it would have been raining. I would have also taken the train straight from the Elm City to Chicago. As it was, I had my 14-year old son with me and Chicago was not on his pre-approved college visit itinerary. Rather than make him truant, I drove the lazy expressway for six hours from New Haven to Rochester. Upon arriving in the suburban paradise called Mendon on the outskirts of the Flower (née Flour) City at 4:00pm, I unloaded my son and excess Yale baggage, wrote and filed two assignments, processed a couple shareholder transactions and quickly packed for my conference. My wife chauffeured me to the train station in the soulless heart of downtown Rochester a half-hour before my listed departure. I waited for nearly an hour. I wasn’t in a hurry because I knew I’d be writing this, a story of disappointment. That story begins months before today and culminates in a surreal conversation with a nice lady at the Rose Alumni House yesterday when most of the east coast normally eats lunch. I woke up late that morning. Say around 10:00am. I wasn’t in a hurry. My son slept through my morning ritual of watching my fingers dance in front of the flat LCD screen of my portable office. By 10:30am I told my still sleeping offspring I was going downstairs to get breakfast. He mumbled his order and rolled over back to sleep. He wasn’t in a hurry. Back home, no one was in a hurry, either. A freakish late April snowstorm had closed the area schools. It turned out his pre-approved day off needn’t have been. Like his hometown friends, he and I slept in. Hmm, maybe he more than me. It was all well and good. Our meetings weren’t booked until after lunch. I did, however, intend to make an unscheduled stop at the AYA office in Rose Hall for the purposes of carrying out a mission requested of me by several classmates. You see, this year marks the thirtieth anniversary since we seceded from Yale. We actually held a secession party in the spring of our senior year, but that’s another story. Come to think of it, maybe it’s not. That particular event in April of 1982 turned out to be our last “official” Cottage party. It featured, as one might expect, mass quantities of adult beverages and pizza. As one might not expect, it also featured a relay race involving a triathlon of questionable juxtaposition, namely, running, chugging certain pre-specified adult beverages and swallowing said pizza whole. In truth, the “swallowing whole” leg was not part of the official rules. It was merely the natural outcome of mixing the stated rule of “eat the pizza as fast as you can” with the normal amount of competitive testosterone that (at least) once lingered vibrantly in the courtyard of Davenport. 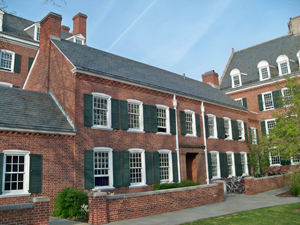 So it is that this, our thirtieth reunion, is slated to occur within the hallowed Georgian walls of Davenport College. It was only natural for the members of the CTO to inquire as to the availability of the Cottage for lodging during the reunion. Calls were made. Emails were sent. Yet we received no official response. It was then I offered to meet with whoever I needed to at AYA to secure the Cottage, or at least get a plausible reason for the denial. Monday morning saw no rain on the streets of New Haven. Well, at least that tiny portion of the tail end of Monday morning when my son and I finally ventured out of the dry confines of our hotel room. We walked unannounced into Rose to find the usual musty smell of age and eerily empty offices. It was as though aliens had stolen away all of mankind. Though barely past noon when you’d expect the staff to be lunching, it seemed odd they didn’t post at least one token carbon life form to remove any reason for suspicion. Tucked away in a labyrinth of halls, we finally found a human who immediately shuttled us off to the correct person. What follows is a summary account of that incredible conversation. Some may laugh. Some may be offended. I merely report the proceedings. The woman (whose name I will not reveal in hopes of preventing any mindless acts of revenge), surfaced from the masonry basement stairwell with a smile and a mouth not quite finished chewing whatever it was she was eating. I apologized for interrupting her meal and told her of my mission. There. That was simple. But I didn’t expect the next bit of dialog. “Why must it be the Cottage?” she asked. I told her I expected five. All I could muster was, “Well, let’s get serious here. The definition of “reckless” changes with age. We’re all over 50 now and, heck, most of us can’t stay up past 11pm.” I said that with a straight face, knowing full well I was up to 4am that very morning putting the finishing edits into my book. What she said next knocked me out. Sixtieth reunion? Do you know how old that is? That’s early 80’s. And they’re having wild parties?! We now have a new goal in life.